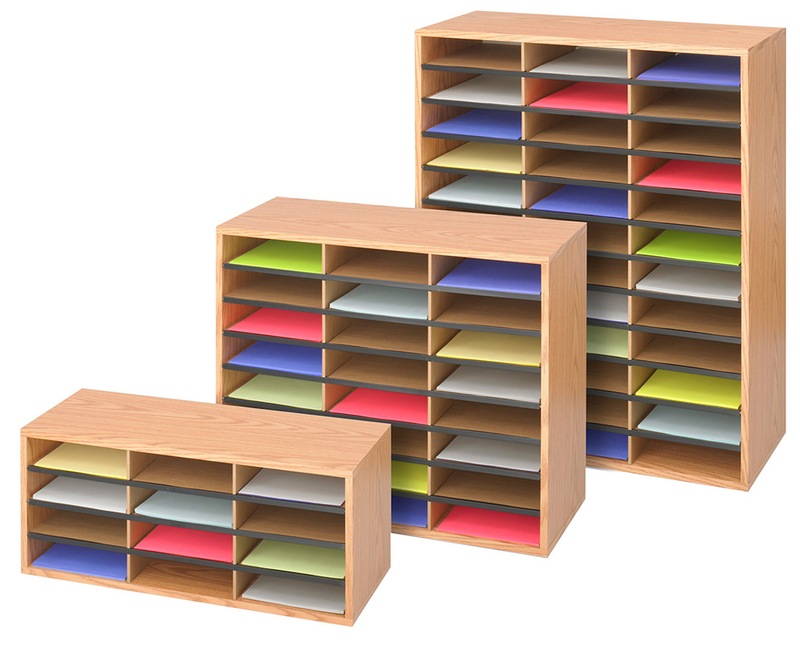 Literature Organizers Available In 5 Sizes To Accommodate Any Storage Need! 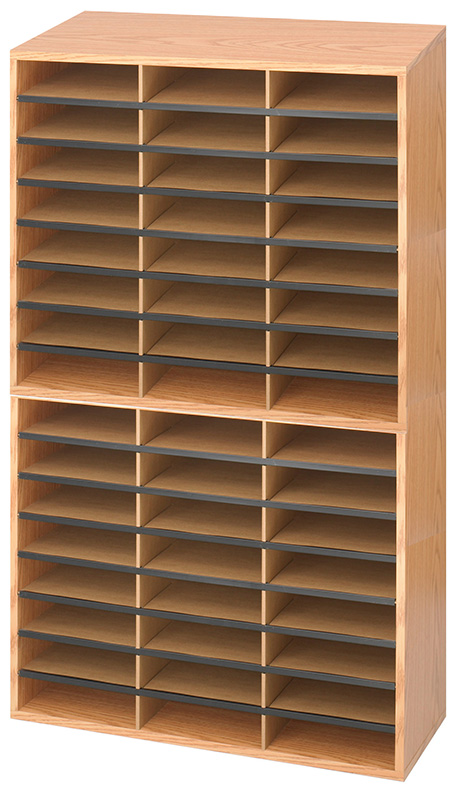 The Economy Oak Finish Literature Organizer Series provides attractive and affordable options for desk top or desk side use. 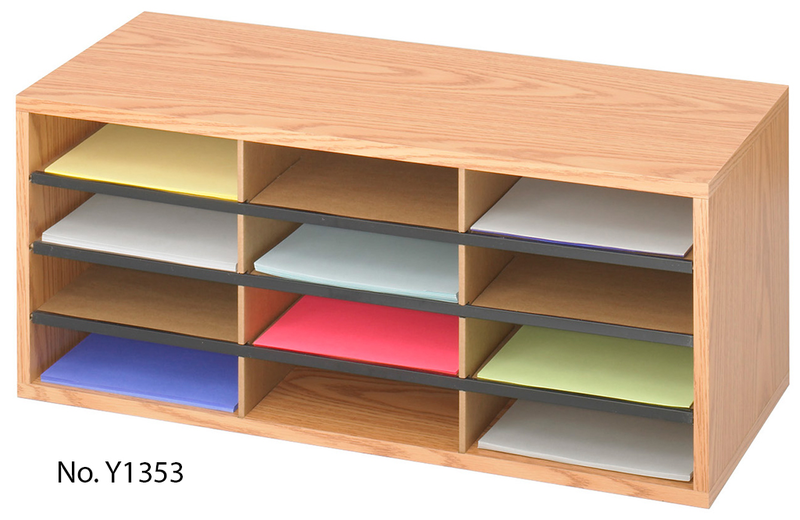 Organizers feature a durable laminate finish; a solid fiberboard back adds strength. Corrugated inserts with black plastic molding serve as a labeling system (labels included). 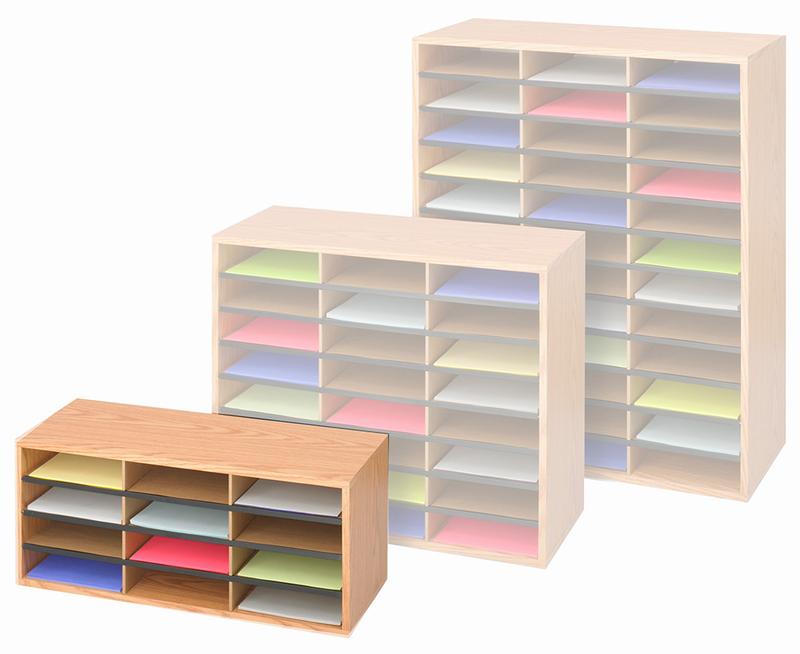 Letter size compartments measure 9"W x 11-3/4"D x 2-1/2"H for storing literature, paper and supplies. Oak laminate finish. 12 Pocket Organizer sold above. 12 Pocket Organizer measures 29"W x 12"D x 12"H overall. Ships unassembled. Shpg. wt. 18 lbs. PRICE INCLUDES SHIPPING! Please allow one to two weeks for delivery. 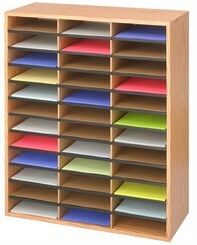 24 Pocket Organizer features an oak laminate finish. Fiberboard back panel. Corrugated inserts with black plastic molding serve as a labeling system (labels included). 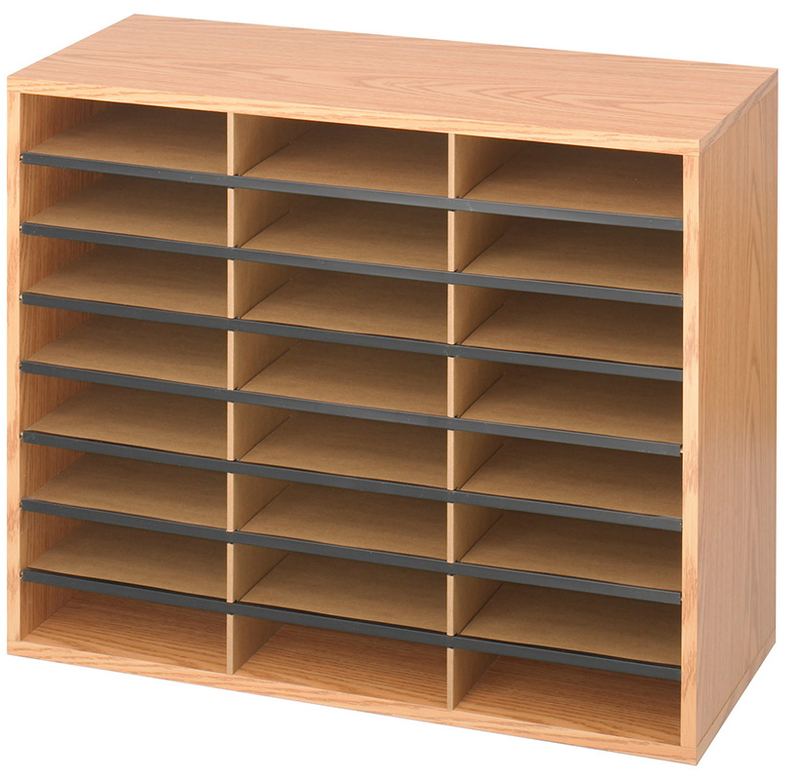 Letter size compartments measure 9"W x 11-3/4"D x 2-1/2"H. Overall measurements are 29"W x 12"D x 23-1/2"H. Shpg. wt. 30 lbs. Ships unassembled. PRICE INCLUDES SHIPPING! 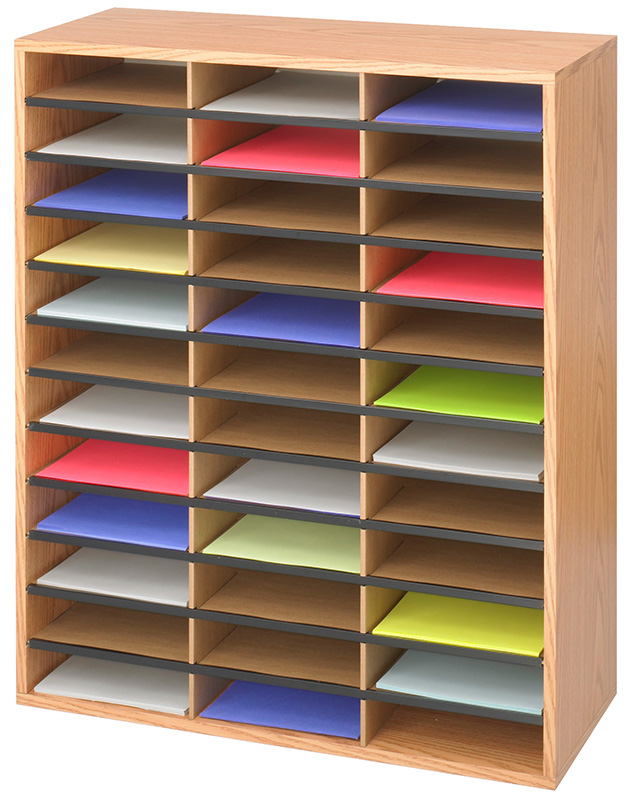 36 Pocket Organizer features an oak laminate finish. Fiberboard back panel. Corrugated inserts with black plastic molding serve as a labeling system (labels included). Letter size compartments measure 9"W x 11-3/4"D x 2-1/2"H. Overall measurements are 29"W x 12"D x 34-1/2"H. Shpg. wt. 35 lbs. Ships unassembled. PRICE INCLUDES SHIPPING! Includes two Y1354, 24 Pocket Organizers to stack to make a 48 Pocket Organizer. Corrugated inserts with black plastic molding serve as a labeling system (labels included). Letter size compartments measure 9"W x 11-3/4"D x 2-1/2"H. Overall measurements are 29"W x 12"D x 47"H. Shpg. wt. 60 lbs. Ships unassembled. PRICE INCLUDES SHIPPING! Includes two Y1355, 36 Pocket Organizers to stack to make a 72 Pocket Organizer. Corrugated inserts with black plastic molding serve as a labeling system (labels included). 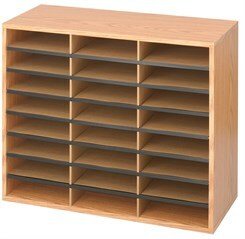 Letter size compartments measure 9"W x 11-3/4"D x 2-1/2"H. Overall measurements are 29"W x 12"D x 69"H. Shpg. wt. 70 lbs. Ships unassembled. PRICE INCLUDES SHIPPING!